Pope Gregory XIII implemented the Gregorian Calendar. In Italy, Poland, Portugal, and Spain October 4 of this year was followed directly by October 15, skipping 10 days. Other countries followed at various later dates. Jean Pilatre de Rozier made the first tethered (captive) balloon ascent. The first successful submarine, the CSS Hunley, sank during a test, killing its inventor, Horace Lawson Hunley, and its crew of seven. J. Palisa discovered asteroid #321 Florentina. J. Helffrich discovered asteroid #2056 Nancy. K. Reinmuth discovered asteroid #796 Sarita. M. Wolf discovered asteroid #3396 Muazzez. M. B. Protitch discovered asteroid #1564 Srbija. Y. Vaisala discovered asteroids #1518 Rovaniemi and #1519 Kajaani. L. Oterma discovered asteroids #1544 Vinterhansenia, #1545 Thernoe, #1695 Walbeck, #1882 Rauma, #2805 Kalle, #2840 Kallavesi, #2946, #3381 and #3597. The Cuban missle crisis started, putting the world in danger of nuclear war. Goethe Link Observatory discovered asteroid #3433. L. Chernykh discovered asteroid #2807 Karl Marx. H. L. Giclas discovered asteroid #2313. Chester Lee, NASA Headquarters director of STS Operations, distributed the first STS Flight Assignment Baseline launch schedule that planned for 22 Shuttle flights (16 operational) by the end of January 1981; only 3 test flights actually occurred by then. E. Bowell discovered asteroids #3564 Talthybius, #3595 Gallagher and #3639 Weidenschilling. Launch complex SLC-6 at Vandenberg, California, was declared operational for shuttle flights. Following US Air Force plan changes after the Challenger disaster, the facility was mothballed without ever launching a shuttle. The SLC-6 launch complex and support buildings at Vandenburg, California, declared operational on 1 October 1985, had been built on the old Manned Orbiting Laboratory facilities at a total cost of $5.5 billion. Checks of the facilities with the non-flying shuttle Enterprise, an external tank, and inert solid rocket boosters were conducted from late 1984 to early 1985. Later, fundamental design flaws were found that would cost another $1 billion and two years to fix, including the possibility of hydrogen propellant pooling in the exhaust tunnels that could potentially explode and damage or destroy an orbiter on the pad. Because of these problems, after the Challenger explosion, the US Air Force was no longer interested in the shuttle as a booster for its payloads, and the facility was mothballed without ever launching a shuttle. The first official supersonic land speed record was set by the ThrustSSC team from the United Kingdom with an average speed between two runs made within an hour of 763.035 miles per hour (Mach 1.020). ThrustSSC (SuperSonic Car) was a British designed and built jet propelled car designed by Richard Noble and Ron Ayers, which holds the world land speed record as of 2016. It was powered by two afterburning Rolls-Royce Spey engines, as used in British variants of the F-4 Phantom II. On 15 October 1997 in the Black Rock Desert in Nevada USA, driven by Andy Green, ThrustSSC became the first land vehicle to smash the sound barrier, reaching an average speed between two runs made within an hour of 1227.986 km/h (763.035 mph, Mach 1.020). 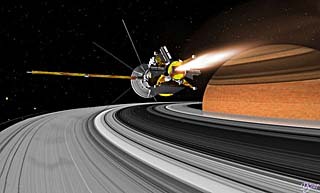 NASA's nuclear powered Cassini probe was launched from Cape Canaveral on its way to Saturn. China launched taikonaut Yang Liwei into orbit aboard Shenzhou 5, their first manned space mission, and became the third nation to send a human into space on their own launch vehicle. The recoverable capsule of China's FSW-3-3 reconnaissance satellite returned to Earth, falling through the roof of an apartment in the village of Penglai, Sichuan, where the woman who lived there had left five minutes earlier. BEIJING (Associated Press) [dateline 18 October 2004] -- A section of a Chinese scientific satellite that was returning from orbit crashed into an apartment building, wrecking the top floor but causing no injuries, according to the Tianfu Morning News. The capsule crashed into the four-story building Friday [15 October] in Penglai, a village in the southwestern province of Sichuan, where the woman who lived there had left five minutes earlier. A photo showed the kettle-shaped capsule, which appeared to be about two meters (six feet) long, lying amid broken bricks, beams and roof tiles. Another photo showed the capsule being lifted off the building as spectators crowded onto surrounding rooftops. The incident was a minor embarrassment for the Chinese space program that sent its first astronaut into orbit in October 2003, and has launched 20 recoverable scientific satellites. The capsule was part of a satellite that spent 18 days in orbit, the newspaper reported. The government's Xinhua News Agency said the rest of the satellite will remain in orbit.